Toni Jo Henry was born Annie Beatrice McQuiston on January 3rd 1916 near Shreveport Louisiana, the third of five children. 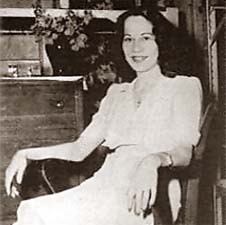 She became the only women to get the electric chair in Louisiana when she was put to death on the 28th November of 1942 for the brutal murder of Joseph P. Calloway on St. Valentine’s Day, February 14th 1940. Toni Jo’s mother died when she was 6 years old and later her father remarried. She was never happy with the new domestic arrangements and begged her aunt to take her away from the family home. She got a job at the age of thirteen in a macaroni factory but was fired when the manager found out her mother had died from tuberculosis. She was beaten by her father when she got home that day and resolved to leave home for good after this. She soon got drawn into prostitution as this was one of the few things she could actually do. She was petite and very pretty with jet black hair so getting customers was not a problem for her. She also took to smoking, drinking, taking cannabis and associating with Shreveport’s underworld. She was arrested several times during her teens including once for assaulting a man, but avoided prison by virtue of her age. In 1939 Toni Jo met Claude “Cowboy” Henry at the Shreveport brothel where she was now working full time and fell for him immediately. He was down on his luck and she felt instantly attracted to him. Cowboy had a criminal record but was also on bail awaiting a second trial over the shooting of an ex police officer. Toni Jo, by this time, was addicted to cocaine so they made a great couple. Cowboy succeeded in getting Toni Jo off the drugs and they got married on November 25th 1939 in Louisiana with Toni Jo using her real name. Cowboy took her on honeymoon to Southern California but their marital bliss was short lived when he received a telegram to appear in court in Texas on the shooting charge. Cowboy turned up at the court despite Toni Jo’s pleas to him to go on the run with her and his second trial also ended in conviction. In January 1940 he was sentenced to 50 years in the Texas State Penitentiary at Huntsville – a sentence which shocked and infuriated Toni Jo who had believed all along in her husband’s story of self defense and his almost certain acquittal. On hearing the sentence she vowed to get him out of jail and thus embarked on series of the most amazing criminal acts which in reality had no hope of success. Toni Jo had contacts in the criminal underworld in Louisiana and southern Texas and immediately started making plans to spring Cowboy despite being warned that the idea was hopeless. She was staying in Beaumont, Texas to be near Cowboy and teamed up with a young man named Harold Burks who was known as Arkinsaw. Arkie, as she called him, had served a sentence in Huntsville and was presently absent without leave from the army. He claimed a detailed knowledge of the jail and together they decided that they could get Cowboy out. They planned to steal a car and then rob a bank, that he knew in a small town in his native Arkansas, to pay for the expenses to be incurred in springing Henry. They armed themselves with pistols which Toni Jo had got a couple of acquaintances to steal for her from a gun shop and posing as newly weds hitched lifts towards Arkansas and their target bank. By the evening of the 14th February they were in Orange, Texas and were looking for the “right” car, and then along it came. Joseph P. Calloway was delivering a new Ford V8 Coupe for a friend when he saw them and decided to offer them a ride. The Ford was perfect for their purposes, new and fast for its day – capable of outrunning the police when the jail break came, so they thought. They drove onwards toward Jennings, Louisiana, where Mr. Calloway was to deliver the car. They had passed through Lake Charles and got out into the countryside when Toni Jo pulled out her 32 caliber revolver and ordered Mr. Calloway to turn off the main highway onto a quiet country road. She told him to stop and then they all got out of the car where to his amazement she ordered him to undress. Arkie gathered up his clothes, his watch and his money – $15. Toni Jo wanted the clothes for Cowboy to change into when they sprang him. She ordered Calloway into the trunk and they set off with Arkie driving and continued for some distance until Toni Jo found a suitable spot. They got Calloway out of the trunk and she walked him across the field to some haystacks. She told him to kneel down and say his prayers and then calmly shot him through the head, killing him instantly. She and Arkie made off in the Ford, driving through the night to Camden, Arkansas, where they had originally intended to rob the bank. They booked into a cheap hotel and while Toni Jo slept, Arkie, who had been completely unnerved by Mr. Calloway’s cold blooded killing, escaped from her in the car taking Calloway’s clothes with him. Murder was certainly not on his agenda – he claimed later that he was broke when he met Toni Jo and just went along with her ludicrous plans as it would be easier to get lifts back to Arkansas in the company of a pretty girl. Finding herself deserted, Toni Jo decided to use the last of the stolen money for a bus ticket back to Shreveport Louisiana. She looked up an old friend who ran a brothel there and who persuaded her to go and stay with her aunt. The aunt clearly realized that Toni Jo was in trouble but was only able to glean fragments of information. Worried she decided to tell her brother who was a policeman but found that he was on vacation. So she explained her concerns to one of his colleagues, Sgt. Dave Walker. Walker accompanied the aunt back to her house where he interviewed Toni Jo. He was aware of Mr. Calloway being reported missing but completely unprepared for the full confession he was about to hear from Toni Jo. She even gave him the revolver with one fired and five live rounds still in it. Walker was disinclined to believe the confession as no murder had been reported and no body or the car found. He decided to arrest her and handed her over to the Lake Charles police who took her out in a car to try and locate the body of the man she claimed to have killed. Eventually they located the correct spot and found Mr. Calloway’s body just as Toni Jo had left it. The bullet that killed him was recovered at the autopsy and was found to match the gun the Walker had taken from Toni Jo. The Ford coupe was soon discovered abandoned in Arkansas and still containing Mr. Calloway’s clothing and cigarette ends with lipstick on them. Toni Jo was formally charged with murder but refused to give any details of her accomplice because she was displeased at the way she was being reported in the press. Eventually she was persuaded to talk and Arkie was soon arrested and brought back to Louisiana and charged with the murder too. They were to be tried separately, however. Toni Jo’s first trial opened in Lake Charles on March 27th 1940 and attracted huge press coverage – she was described in the press as a sultry brunette. In it she tried to shift the blame for the killing onto Arkie but the jury didn’t believe her and after deliberating for 7 hours she was guilty of murder and sentenced to death. 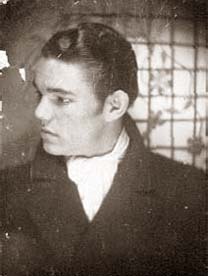 Arkie was also convicted at his trial later in the year and sentenced to death. She appealed on the grounds that the trial judge had permitted conduct prejudicial to her case and was granted a retrial which took place in February 1941. Arkie testified against her and the jury took only an hour to convict her. Again she heard the death sentence pronounced on her and again she appealed and won. Her third trial took place in January 1942 with, the by now, usual outcome. This time the Supreme Court saw no reason to overturn the lower court but her lawyers challenged the constitutionality of her sentence. While Toni Jo had been going through the courts Louisiana had changed its execution method from hanging to electrocution. The court found that this was in line with constitution, however, and the state Governor let it be known that there would be no reprieve. While the various court cases rumbled on Toni Jo had been incarcerated in Lake Charles prison. Here she was baptized by Father Wayne Richard a Catholic priest who attended her. Towards the end she granted an interview to reporters where she tried to explain her feelings towards Cowboy. She also made a sworn statement saying that it was she who shot Mr. Calloway in a final bid to clear Arkie. On November 23rd 1942 Cowboy and an accomplice decided to break out of the Texas prison farm where he had been transferred in at attempt to rescue Toni Jo. This daft venture was quickly over and he was recaptured and taken back to Huntsville. On Friday the 27th Toni Jo was allowed to phone Cowboy from the chief jailers office and is reported to have told him “Get rid of that prison suit go out the front door. Go straight and try and make something of your life.” He was crying and emotional throughout the call and yet she was bright and cheerful. Toni Jo’s execution was set for Saturday the 28th November 1942 at 12:05 p.m. She was to be executed within the basement of the Lake Charles prison in Louisiana’s portable electric chair which had been brought from Angola the previous day. She had chosen a plain black dress and black pumps and was said to have cried when her head was shaved She requested and was allowed to wear a brightly colored scarf to hide her baldness. Kenny Reid, the Deputy Sheriff, in charge of her, read her the death warrant and asked her if she had any final statement. 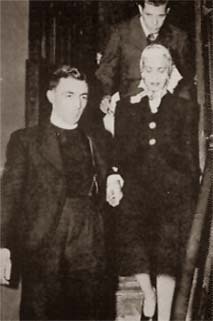 She replied “I think not” and was then led to the execution chamber, holding Father Richard’s hand. She admitted to being somewhat nervous and afraid but went calmly to her death. Several press reporters were present and she managed a smile for them. A photograph of the procession to the execution room is shown. She was strapped into the chair, the electrodes applied to her shaven head and her calf and a leather mask put over her face. She was allowed to pray for a few moments and then the executioner said “Goodbye Toni Jo” and she mumbled a reply. A moment later 2000 volts hit her and at 12:12 p.m. she was certified dead by the prison doctor. Her body was removed a few minutes later. Her last request was that a crucifix be left in her hand when she was buried. Father Richard officiated at her burial in a cemetery in Lake Charles and designed the headstone for her grave. Arkie was executed in the same electric chair four months later, despite Toni Jo’s belated efforts to take responsibility for the murder after she had lost her final appeal. No relatives came forward to claim his body so it was buried in an unmarked grave. As crimes go Toni Jo’s was ill planned, under resourced and had virtually no hope of success from the word go. It would seem too easy just to have stolen a car off the street, instead of hijacking one and killing its driver. Would she and Arkie be able to successfully raid the bank in Camden? How did she really think that she was going to get her Cowboy out of a large, heavily guarded and well run jail like Huntsville? There are no obvious answers to these questions other than she had absolutely no chance of success. At the time of the murder she would have been hanged, if convicted, as Julia Moore had been just four years earlier . And yet none of this seemed to register with her at all. So what were her motives for these crimes. It seems that the only true motive was her total love for Cowboy Henry which was so strong it overcame all practical considerations, including her own safety. And yet why did she instantly confess to a murder that, at the time, had not even been discovered? Why hadn’t she disposed of the gun which was a major piece of evidence against her. She co-operated fully with the police in finding Mr. Calloway’s body. Had she disposed of the gun carefully, cleaned the car up with Arkie and kept her mouth shut there would have been very little to connect her to the killing. We will never know the answers to these questions. For a detailed account of this case read Stone Justice by Lawrence King. Text and photos taken from the Brian Rick’s Family Tree website.